MIDI controllers are often used to control MADRIX remotely. While you can use preconfigured MIDI maps [i.e., a MIDI Remote Configuration], you can also set up such a configuration according to your needs with the help of the MIDI Remote Editor. This topic describes how to use the MIDI Remote Editor. ▪ Make sure to configure your MIDI device first. ▪ Set up MIDI Remote Control. ▪ If you are creating a new MIDI map, the list will be empty. ▪ If you are modifying an existing MIDI map, the list will already contain all preconfigured settings. Add - Adds a new item to the list. Remove - Removes the currently selected list items. Duplicate/Copy - Copies and duplicates the currently selected list item. The new item will be added to the list right after the selected item. You can change its settings afterwards. Navigation - Allows you to select the next or previous list item. New - Creates a new MIDI Remote Configuration while deleting all previous list items with your permission. - Allows you to create an empty MIDI map [Emtpy] or load a preconfigured MIDI map. Open - Loads a MIDI Remote Configuration into the MIDI Remote Editor from an external file [of the file type *.mmrx]. Save - Saves the current MIDI Remote Configuration to an external file [of the file type *.mmrx]. Save As - Save the current MIDI Remote Configuration to another external file [of the file type *.mmrx]. Simply enter a name and click Save. Assign - Allows you to assign a control of your MIDI console to a function in MADRIX. 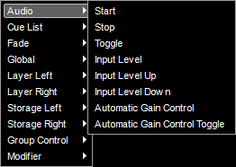 - 1] Activate Assign, select an list item you created and move the control of your MIDI controller. Test - Allows you to test single list items and their functionality on the MADRIX user interface, while having the MIDI Remote Editor still opened. - Activate Test, then use the control on your MIDI controller. You can see if the control works as expected on the MADRIX user interface. - If Test is activated, MADRIX will receive the signal directly and not the MIDI Remote Editor. Configuration Name - Allows you to type in an individual description for your MIDI configuration. - Once saved, you will be able to select your MIDI configuration under Preferences > Device Manager... > MIDI > Remote Control and MADRIX will use this label. Selects all items in the list. Activates Assign, while holding this shortcut. Creates a new MIDI map. Activates Test, while holding this shortcut. Removes selected items from the list. Navigates upwards in the list. Navigates downwards in the list. Calls up the context menu for the column. Sorts the list alphabetically according to the column [ascending or descending]. ▪ Each list item represents 1 MIDI remote functionality using 1 MIDI control [i.e., button, fader, note, etc.]. ▪ Configure each list item as required. ▪ Configure each column of an list item. ▪ Add or remove list items to add or remove the functionality you require. A] Click Assign, select a list item and use a control on your MIDI controller. In most cases, MADRIX will automatically recognize the MIDI Command, Control Type, and Interaction. - In general, MIDI offers 16 channels. You can configure each MIDI device to send on a particular channel. Make sure that this Channel is also selected here. B] Or first select a list item and perform a double-click with your mouse on the column Control Type. Second, select the type of the control of your MIDI controller [e.g., Button]. ▪ Fader / Knob - Defines a fader or knob control that has a wide range of available values with starting point and end point. ▪ Encoder / Jogwheel - Defines a knob or wheel control that has a wide range of available values that functions endlessly without a starting point or endpoint. ▪ Button - Defines a button control that has two states [On or Off]; often as switch, push button, or button. B] Or first select a list item and perform a double-click with your mouse on the column Interaction. Second, select the mode [e.g., Toggle]. ▪ Toggle - Defines that the Control Type only has two states [On or Off]. Is usually used for Button. ▪ Relative Signed - Is a mode how encoders / jogwheels can work. Use Assign to automatically detect the mode or consult the manual of the MIDI controller. ▪ Relative Signed 2 - Is a mode how encoders / jogwheels can work. Use Assign to automatically detect the mode or consult the manual of the MIDI controller. ▪ Relative Binary Offset - Is a mode how encoders / jogwheels can work. Use Assign to automatically detect the mode or consult the manual of the MIDI controller. ▪ Relative Signed 2's Complement - Is a mode how encoders / jogwheels can work. Use Assign to automatically detect the mode or consult the manual of the MIDI controller. ▪ Absolute - Defines that the Control Type uses all available values [e.g., 0 to 255]. Is usually used for Fader / Knob. 1] Select a list item and perform a double-click with your mouse on the column Invert. - If Yes is selected, all values of this control will be inverted. That means for example that 0 becomes 255 and 255 becomes 0. - No is the default value. No values will be inverted. 1] Select a list item and perform a double-click with your mouse on the column Cond. 2] Select the condition [e.g., None]. ▪ Select an item and perform a double-click with your mouse on the column MIN, MAX, Factor, or Description. Enter the desired value or text. ▪ MIN - Defines a minimum value for this functionality. The default value is 0. ▪ MAX - Defines a maximum value for this functionality. 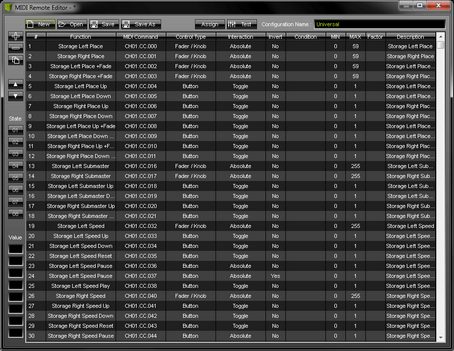 - For example, the Master has a maximum value of 255, or you may want to set the maximum Fade Time to 10 seconds. ▪ Factor - Valid values range from -127 and +127. 0 is the default value. Use this factor to slow down [-127 to -1] or speed up [+1 to +127] controls of your MIDI controller. - For example, a jog wheel might be to fast to select mix modes of MADRIX. Slow it down by entering a negative value. ▪ Description - Allows you to enter a text to describe the functionality. - [By default, the name of the function will automatically be entered]. The MIDI Remote Editor allows you to create advanced MIDI configurations. ▪ Modifiers allow you to set certain conditions. 5] Assign the condition to this function. ▪ State - Creates a requirement/condition that is required before the function will work. ▪ You can define up to 8 States. ▪ Valid values are Yes [Value = 1] or No [Value = 0]. ▪ Normally, you should set up MIN = 0 and MAX = 1 for the corresponding State. - List item 1 defines a button as a Modifier, State 1 to be toggled. When pressed, MAX defines that a value of 1 is send to MADRIX. When not pressed, MIN defines that value 0 is sent to MADRIX. - List item 2 is a function to control the Master [Global Master]. A Condition was set up for this functionality. If MADRIX receives value 1 [Yes] from State 1, the function can be used. - When Test is activated, MADRIX shows the status of a State in the MIDI Remote Editor. A green button indicates status Yes, a gray button indicates status No. ▪ Value - Allows to add several functions to one or more controls of the MIDI controller by combining it with other available controls. ▪ You can define up to 8 Values. ▪ Valid values range from 0 to 127. - Your MIDI controller may only have 1 fader and a number of buttons. - But you would want to control the Master, the Speed Master Left, and the Speed Master Right with this one fader. - In this example, we have configured 3 buttons that activate three different configurations for the fader. - If button 1 is pressed one time, the fader will act as the Master. - If button 2 is pressed one time, the fader will act as Speed Master Left. - If button 3 is pressed one time, the fader will act as Speed Master Right. - Depending on which button is pressed, the modifier value changes between 1, 2, or 3. MADRIX checks this value and allows the fader to control the corresponding function on the MADRIX user interface. ▪ Note: Always assign the correct values to modifier and function. - For example if your modifier is assigned to Value 1 and Max. value 2, the function needs to have Value 1=002 as a Condition. In this case, Value 2=002 will not work! ▪ When Test is activated, MADRIX shows the status of a Value in the MIDI Remote Editor. ▪ You wish to use single buttons of your MIDI controller for each Storage Place. ▪ Use + to create a new function. ▪ Use Assign to match your button to this function. Disable Assign again when done. ▪ Set MAX to 0 in order to trigger Storage Left S1 P1 [Storage 1 Place 1]. ▪ Repeat the steps and set up MAX for each Storage Place you wish to control. ▪ Use Storage Right > Place +Fade and repeat the steps accordingly to control the Storage Places on the right side.